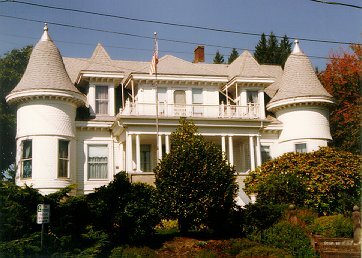 Commissioned about 1898 by Thomas Flippin and built by Markwell & Sons “The Flippin Castle” stands high on the hill in the town of Clatskanie, Columbia County, Oregon. Flippin was an early day “gypo” logger and sawmill owner. His family lived in sawmill shacks, crude houses built of rough boards. They carried their water from the spring and chopped wood for the kitchen stove which also heated the shack. The Flippins prospered by dint of hard work and before long Tom decided to have a castle built. “A man’s home is his castle, and so I built mine to look like one,” said Tom. The house has been restored as near as possible to its original state. Old timers around Rainier will recall the area was known as “Cedar Landing” and the wharf as “The Moeck Dock.” Later the area was referred to as “Kentucky Flat.” The 1888 House is now owned by Jeff and Mary Mullins who use it for a family business. They sell antiques and collectables. Stop in for a visit.